the thing about eggplant is that it’s not fun to eat raw. i have a feeling that people who dislike or are even on the fence about eggplant have suffered through a meal of half-cooked stir-fried eggplant, for instance. if you follow simon hopkinson’s instructions perfectly, but use an eggplant as large as the one i used, you would be very disappointed. checking for doneness can be just as important as checking your seasoning–something else you should do with this, and every other recipe you follow. eggplant as luscious as marrow. 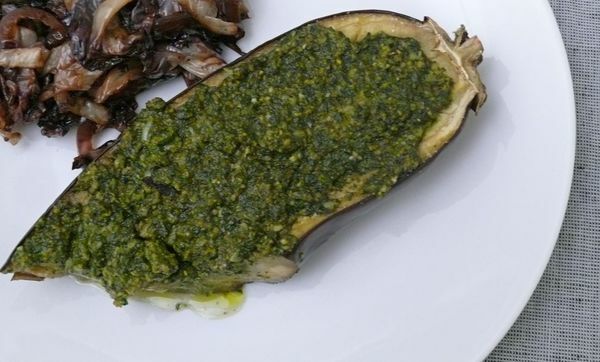 trust me, eggplant baked with oil until it’s positively silky is quite comparable in texture to marrow (something you couldn’t keep me away from in my meat-eating days), and adding this much pesto to the top is simply indulgent. if you feel the need to restrain yourself a little, using half the pesto would probably be fine. otherwise, slather away, stand by during the broiling phase, and try to contain yourself while the bubbling vegetable and sauce cools down enough to dive into. ys notes: the size of the eggplant will determine the baking time. i suggest checking the eggplant after 30 minutes and if the eggplant is still opaque at the base, bake for another 5 minutes before broiling. also, if your eggplant is very large, score the eggplant 3/4 of the way to the skin, not just 3/4 inch deep. oh, and if the eggplant your cooking is that large, believe me, this recipe will serve 4.
preheat the oven to 425°F. cut the eggplant lengthwise in half, through the stalk. using a small, sharp knife, make a crisscross pattern across the cut surfaces, to a depth of about 3/4 inch. brush with a little of the olive oil and season. bake in the oven for 20 to 30 minutes. the flesh should be very soft. meanwhile, lightly toast the pine nuts in a dry skillet, then remove from the skillet and cool. process the basil, garlic, and pine nuts, together with a little salt and pepper, to a paste in a food processor (or use a mortar and pestle for a more authentic result). now add enough of the olive oil to produce a loose-textured purée. finally, briefly mix in the cheese. 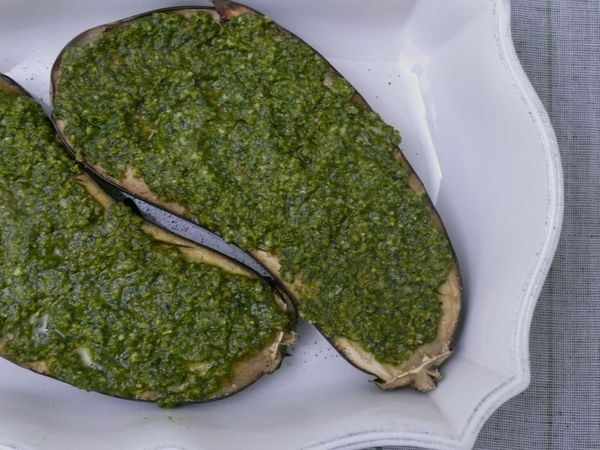 spread the pesto over the scored surfaces of the eggplant and broil until golden and bubbling. serve with a squeeze of lemon. Looks so creepy dish . Its shape like a shoe soul. Thanks for share its making guide i want forward this to my friends. it does look like shoe sole. that would have been a better way to describe the taste when undercooked too.